Everywhere life takes me, I cannot help but notice people being kind to one another and to me. I call it camerado-ing, the verb form of camerado. It has long been my intention to share these vignettes of compassion-in-action, and to feature miniature biographical sketches of camerados I have met along the way, on my Website. I am finally able to do this now that my Website has been restructured. This, then, is the first installment in a series I’ve been wanting to write ever since the release of Camerado, I Give You My Hand. Come. Let me introduce you to Peggy. I want you to meet her because she’s pretty special. 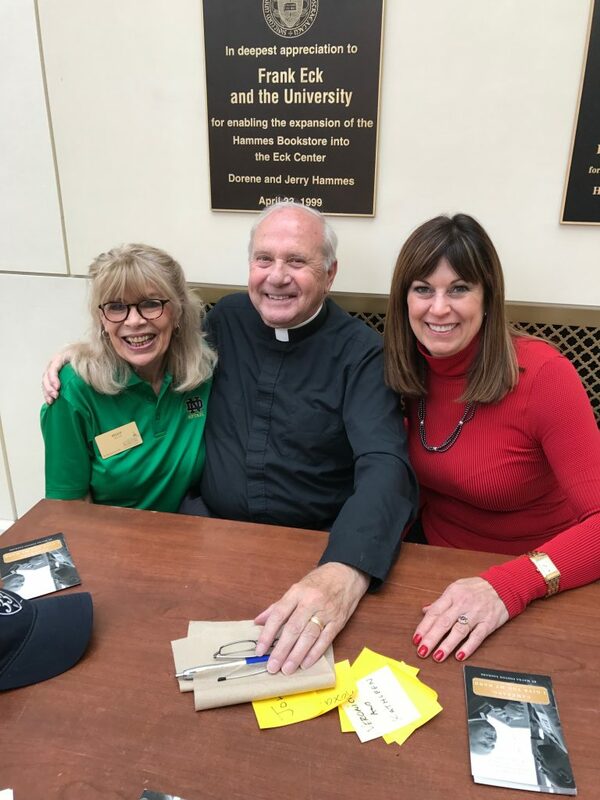 One of the greatest rewards of having written a book about a University of Notre Dame Law School dean emeritus is the thrill of being invited to sign copies of this book at Hammes Bookstore http://tour.nd.edu/locations/notre-dame-bookstore/ on the campus at Notre Dame. There aren’t many places a bookaphile like me would rather be than in a bookstore–any bookstore. But to be in this particular bookstore on home football game weekends? It’s an electrifying experience. The store crackles with all the pent-up energy and verve unleashed by alumni and their awe-struck friends and families. 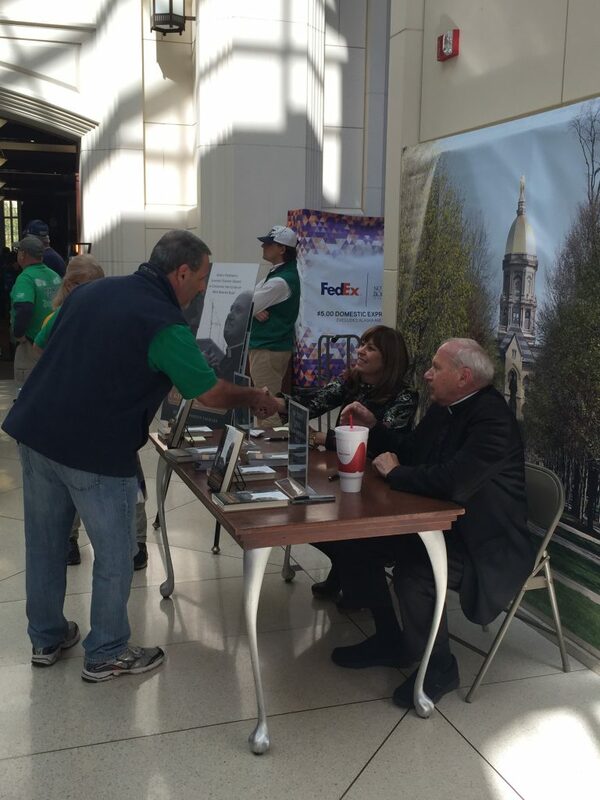 Authors of Notre Dame-related books who have been invited to personalize copies are seated at tables in the two-story, cathedral-ceilinged atrium entrance. 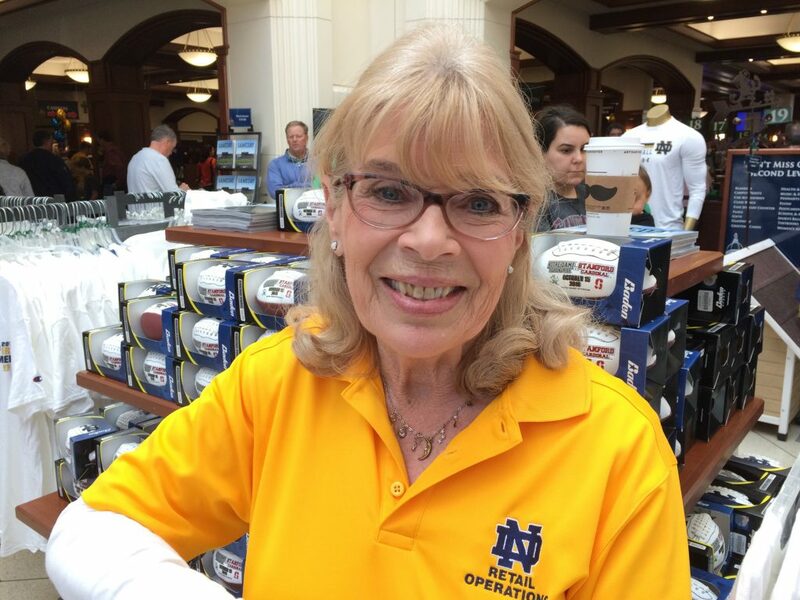 There, we have front-row seats to catch expressions of happiness and awe that characterize the faces of hundreds of Notre Dame fans as they stream through the doors. A singular feature is that for the duration of the book signing, every author is assisted by at least one, oftentimes two, assistants. These helpful people fetch us cold water, iced tea or coffee. They make sure we have sharpies and sticky note pads. They stand in as photographers, taking cell phone pictures of meet-and-greets. Most importantly, they run interference for people who want to buy books but who reconsider when they eye the long lines at the checkout counters; the assistants can shortcut those lines by going straight to a checkout clerk and transacting the book purchase for the customer. Meanwhile, we can continue talking with that person. It always feels like I’m at a really fun party. I just love meeting new people and hearing their stories. 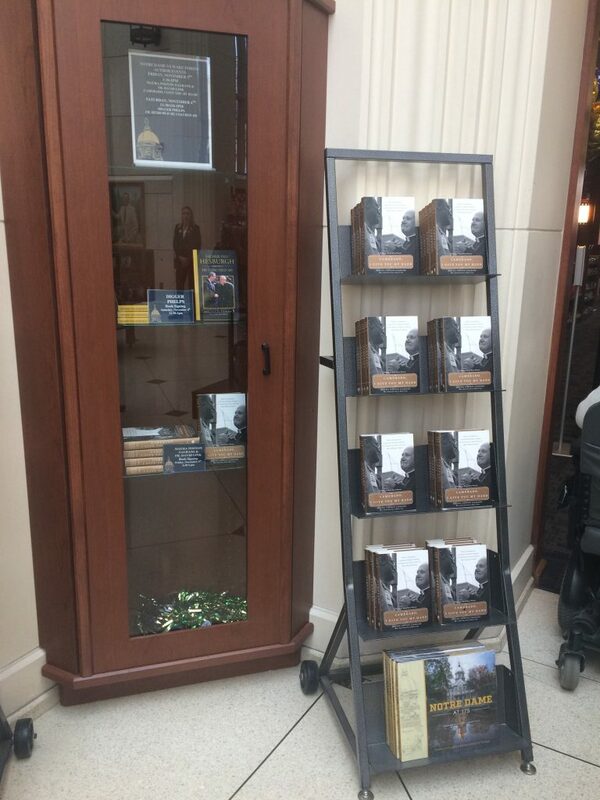 I remember thinking at my first Hammes book signing that this must be what it’s like to be famous–like, Oprah-famous. The attention lavished upon me by these assistants is nothing short of addictive. Leaving when my signing time slot comes to an end is worse than getting out of a steaming-hot bubble bath. I just never want to go. So this is the context in which I met Peggy, who has worked at Hammes for many years. She was assigned to Father Dave and I one glorious autumnal weekend, and something clicked between us. 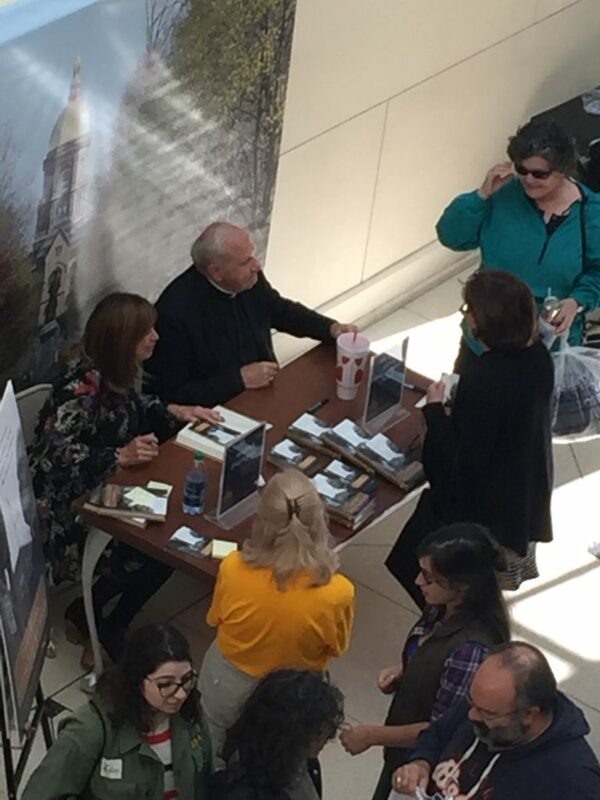 Peggy and I came to know one another better and better during subsequent book signings. I loved the way she laughed at all of Father Dave’s jokes–even the ones she had heard before. I admired how smooth she was at knowing just when to interject and offer her help in shortcutting that checkout line. I have learned that Peggy is surrounded by the fruits of a lifetime of love. She just celebrated her 50th wedding anniversary. Her husband surprised her with the gift of a Schwinn bicycle made the year that she was born, a bike that he himself refurbished to gleaming newness. She is a mother, sister, friend, cheerleader and staunch ally in ways that inspire loyalty and appreciation in others, and admiration in me. All of this is super-cool, of course. But, perhaps more than anything else, as an author who has spent many years of my life writing and babysitting Camerado, I love perhaps most of all the way Peggy “got” my book. One week, Peggy showed me the charm hanging from a silver chain she wore around her neck. The charm was a quarter moon. What she told me about this charm blew me away. She told me that she had gone out and bought the necklace after having read my favorite line in (and what I consider to be the “climax,” if you will, of) my book. On page 72: I need to see the moon. Peggy wears this necklace to remind herself to go outside, turn her face upward, and take in the indescribably beautiful celestial skies. Perhaps the greatest lesson of Camerado is just that: We need to see the moon. When I sign books these days, this is what I write on the title page: Always admire the moon. It is my fervent wish that we all do this one tiny thing because I know that it will initiate a cascade of other meaningful actions. Here’s to Peggy. Peggy, thank you for being a camerado. Thank you for becoming my friend.